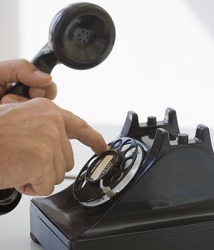 The rotary phone is a remnant of telephone communication that is obsolete in today's technology. The definition of a remnant is something left over or an indication of the past. An example of a remnant is the last yard of fabric that remains after all the other fabric has been sold. An example of a remnant of the past is rotary telephones. "remnant." YourDictionary, n.d. Web. 18 April 2019. <https://www.yourdictionary.com/Remnant>. Middle English remanant, remnant from Old French remanant from present participle of remaindre to remain ; see remain . The small portion remaining of a larger thing or group. The remaining fabric at the end of the bolt. Usually not enough to make an entire project by itself, remnants of several fabrics can be used to make quilts. An unsold end of piece goods, as cloth, ribbons, carpets, etc.